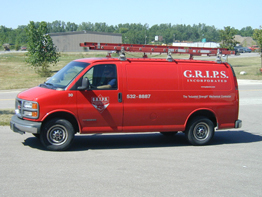 "saving the world one project at a time"
G.R.I.P.S., Inc. has over 80 years of combined experience and know how to provide you with the quality HVAC system you desire. We are committed to working with building owners, architects, and general contractors, applying our knowledge and experience to install building mechanical systems large or small, that are correctly designed to satisfy building demand parameters and specifications. With that goal, our professional team will discuss your needs, desires, and building uses. Examine your requirements, and recommend options that will best fit your needs. Our projects have encompassed many types of systems, from in floor heating, air make up (AMU), roof top units (RTU), chillers, heat pumps, air exhaust systems, air circulation systems. and cooling tower systems to name a few. Each installation is designed to meet and satisfy the building requirements. Our project leaders will insure quality professional work in a timely manner, within the general contractor schedule. Project leaders will also keep open the lines of communication to insure project completion to everyone's satisfaction. Whether it is Design and Build or Bid and Spec choose G.R.I.P.S. to install a system for you.